At a price point far, far too high. You've undoubtedly heard of the Angry Birds franchise by now. The mobile game has transcended beyond the borders of a $1 downloadable title to become a cultural phenomenon played by gamers and traditional non-gamers alike. It's odd to think a small game about avians and swines can spawn an entire line of merchandise including plushies and clothing, but that's exactly what Angry Birds has become. When you combine it with perhaps the most merchandised franchise of all time with Star Wars, you should have something bound to attract even more attention and dollars. 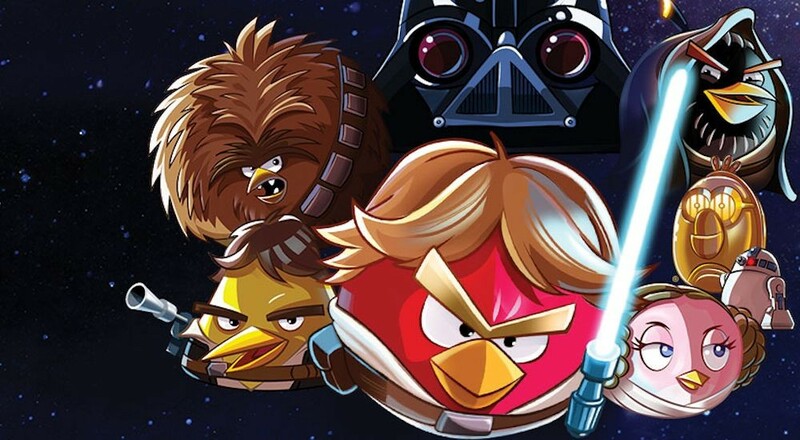 The first thing we have to mention about Angry Birds Star Wars on the console is the price. It's $50. Yes, you read that right, $50 on the Xbox One, 360, PS4, PS3, and Wii U. This isn't a digital only release; it's a full retail title at a full retail price. You can get the game on mobile platforms and tablets for $1 to $3. There is no amount of exclusive content short of packaging in the ORIGINAL trilogy on Blu-Ray that would justify that cost. What does the game include to “make up” for the cost? There are 20 bonus levels and brand new competitive and cooperative modes as well as a several pieces of content that were DLC. Pricing aside, Angry Birds Star Wars is a damn fun game and the best one in the Angry Birds series. Gone are the familiar Red, Yellow, and other colored fouls and in its place are birds dressed as Luke Skywalker, Obi-Wan Kenobi and Han Solo. Each bird's special power is similar to their portrayed character. Luke can launch a circular attack with his light saber, Obi-Wan can force push blocks and Han Solo can shoot first with his blaster. It's in combining these birds and other birds powers together that the puzzle elements of the levels truly become interesting. 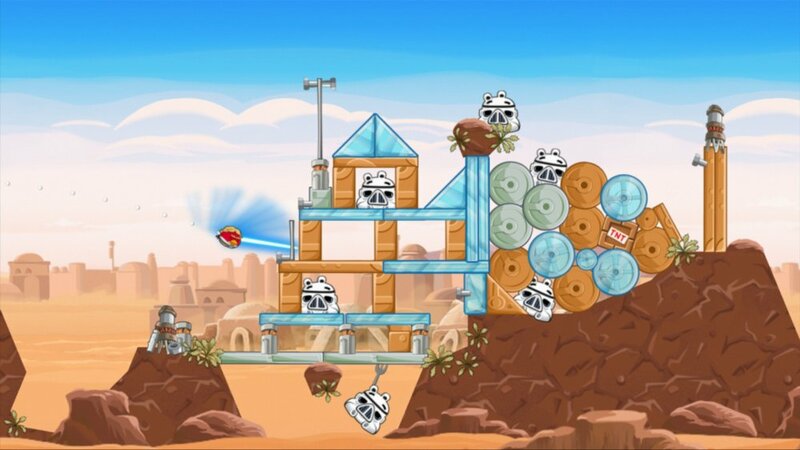 Featuring over 200 levels, Angry Birds Star Wars is a retelling of Episode IV and beyond. You'll start at Tatooine and soon be whisked away to space, finding yourself in the Death Star for a trench run. Each level does a decent job of introducing new twists to the physics based puzzle formula while also presenting a layout that reminds you of scenes from Star Wars itself. For instance an early level on Tatooine looks like a jawa sandcrawler. Once you hit the levels that are set in space, the game unsurprisingly utilizes mechanics learned from Angry Birds in Space. Puzzles now include using gravity mechanics and free floating circular planet levels to continue knocking down blocks and defeating the storm trooper outfit wearing pigs. Moving to the console and away from touch screens also presents a few issues with the controls. The left analog stick is utilize for aiming and power while a simple button press activates the special ability of the bird. It's a little sensitive at times and works well enough, but it's definitely not as easy as the touch screen. If you own the PS4 you can use the DualShock 4's touchpad to mimick a touch screen, or PlayStation 3 owners can use a PlayStation Move. This will get you closer to the traditional experience of the game. Enough can't be said about the pure Angry Birds personality and style that oozes through the Star Wars iteration of this game. It's a careful blend of edgy comedy, while not veering too far off of the source material. It's close to what the LEGO franchise of games have done for their respective sources, but the colorful and animated cartoon drawings are really are showcased on an HDTV instead of a few inches of a phone or tablet. While the game's competitive mode is nothing more than a real time high score contest, the new cooperative mode had a chance to do something different. Angry Birds Star Wars's couch co-op mode could have served to really add some unique puzzle elements to the game, especially considering the powers available using the different birds. Sadly what's available is merely no more than a pass the controller scenario. Players take on the game's levels, taking turns launching each bird in the queue. Each player has their own score for the level, though both scores contribute to the overall rating. This adds a bit of a competitive element to the mode. It would have been great to see simultaenous launching of the birds and puzzles that required the players to work together to actually solve. While the price of a game is relative to when it is purchased, it's hard to recommend Angry Bird Star Wars on console right now at the full $50 price point. It's already dropped slightly on retail sites like Amazon.com to $30-$40, but really you shouldn't be paying more than $15 or $20 for this. There's a great amount of content here and its one of the few launch games on next-gen platforms that are truly kid friendly. 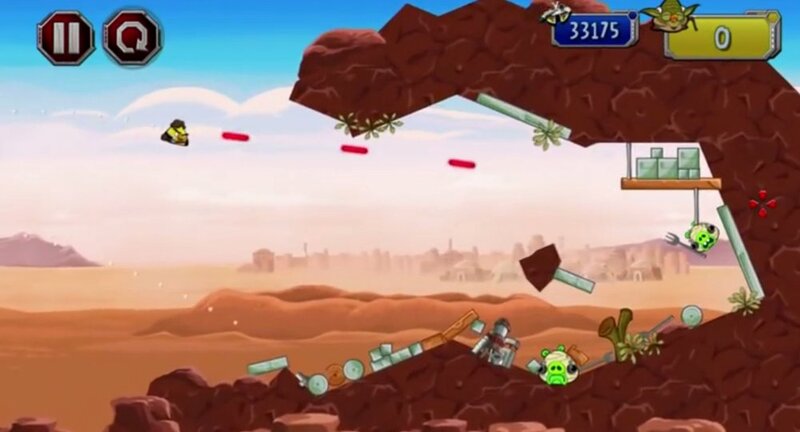 The Co-Optimus Review of Angry Birds Star Wars is based on the Xbox One version of the game. A copy of the game was provided by the publisher for evaluation purposes. The Co-Op Experience: Take turns with a second player as you work together to topple the evil Empire. Page created in 1.4000 seconds.